I'd heard Mo Hayder's name mentioned on several occasions in various book discussion groups, which immediately piqued my curiosity. I decided it was time to find out more. Looking through her back catalogue I settled upon Pig Island, one of her standalone novels with seemingly dark undertones. I was excited - it could be right up my alley. It immediately appealed with it's cover art of foreboding dark skies and Celtic cross towering above the landscape. From the outset I found it to be an atmospheric and creepy read. When a video comes to light of a strange creature seen on Pig Island's beach, it leads to rumours of Satanic worship and rituals. Journalist Joe Oakes goes in search of his old nemesis - cult leader and all-round madman, Malachi Dove - who has made the island his home. What Joe discovers is a divided community with Dove's ex-followers now living in fear. Skillfully written with a plot that slowly grips and doesn't surrender, I really enjoyed this novel. It's dark and creepy; encompassing different genres. Yes, there are moments that will leave you chilled but it's not a blood-curdling shocker. It instills a growing sense of unease and a strong feeling that something's not right. Admittedly it wont be everyone's idea of a bedtime read, but I loved the journey it took me on and look forward to reading more by this author. Journalist Joe Oakes makes a living exposing supernatural hoaxes.But what he sees when he visits a secretive religious community on a remote Scottish island forces him to question everything he thought he knew. Why have the islanders been accused of Satanism? What has happened to their leader?And why will no one discuss the strange creature seen wandering the lonely beaches of Pig Island? 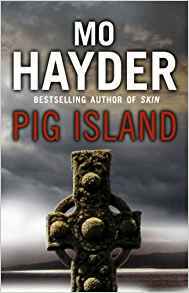 In PIG ISLAND, Mo Hayder dares you to face your fears head on and to look at what lurks beneath the surface of everyday normality.It's about the unspeakable things people do to each other. Brace yourself for a terrifying read. Mo Hayder has written some of the most terrifying crime thrillers you will ever read. 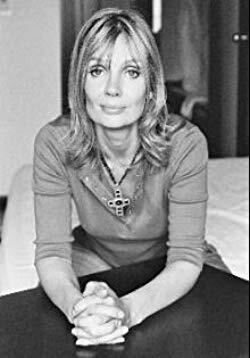 Her first novel, Birdman, was hailed as a 'first-class shocker' by the Guardian and her follow-up, The Treatment was voted by the Times one of 'the top ten most scary thrillers ever written'. Mo's books are 100% authentic, drawing on her long research association with several UK police forces and on her personal encounters with criminals and prostitutes. She left school at 15 and has worked as a barmaid, security guard, English teacher, and even a hostess in a Tokyo club. She has an MA in film making from the American University in Washington DC and an MA in creative writing from Bath Spa University. She now lives in England's West Country and is a full-time writer.